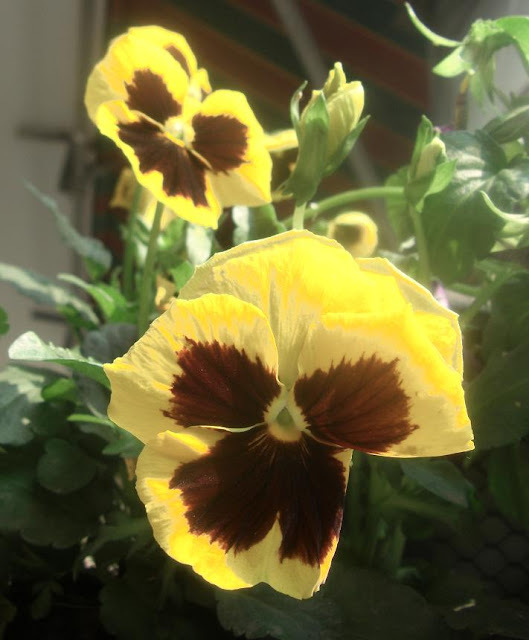 Your pansies are beautiful and can't help but make one smile. I am facing the same thing with my parents, especially my father. It is so true that we don't want to tell them things that would stress them out. I also find that I have to repeat things. Flowers definitely do help! As caregiver for each of my parents until their passing and now my husband I surely understand. Mid to late afternoons seem to be worst for the aging. Perhaps if you could get them to watch a particular show or listen to music or a book on tape at the time of day that they call you most often at work. They might also enjoy feeling useful again. Once mother's mind got so bad, she enjoyed folding clothes for me (she never knew it was the same towels over and over). Is there a senior center in your area where they could go daily to meet with folks their age, have a meal. If I can help at all, please feel free to email me. I know it's difficult. May God bless. Your words are beautiful and moving, and rings so true. I have lived far from my parents for almost 2 decades, we have very little in common, and were never really on the same page. I get annoyed when my dad talks about the weather, but really, there isn't all that much more to say. One of my inlaws is dealing with advanced alzheimers, the confusion is difficult to cope with. Sorry this got so long and personal, your post really got to me. 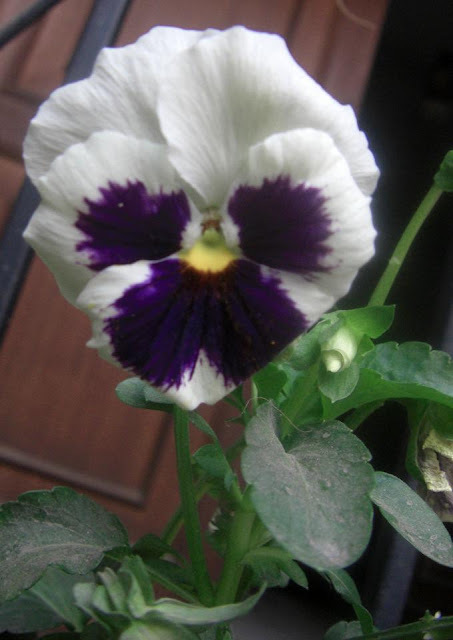 The pansies are beautiful, I always think they are smiling. I know it's difficult at times but we are the only ones who can make our parents happy so we should give them all we can. Gorgeous Pansies. My parents are in their 80's so I understand perfectly. It is natural that you do get irritated sometimes. Only make sure to let them know that you appreciate how much they have done for you and that you love them. I think that is all they want at that stage. First time here - Lovely blog. Even though my parents aren't that old, I still have noticed signs of them beginning to seem older to me. I admit that like you, there are some times I feel impatient and then guilty for being that way. I'm sure you are a very good daughter to them, and they know you love them. I love the Pansies, that first purple one sparkles. It is certainly difficult to see parents grow old. I have only my mum around now. I thank God for health everyday. Love the pansies you have posted here. Nature, flowers have a way to calm us down whenever we are stressed :-D Have a great weekend. I know just exactly what you are talking about with aging parents. I feel so guilty about my Mum and my Dad is gone now but I still think of him all the time. Now my children are grown I miss them terribly when they are not here, so I am beginning to see the other side of the coin. I thought you might like to meet my blogging friend Tootsie. She is on my blog side bar as "Tootsie Time" and hosts a prompt called Friday Fertilizer which I take part in when I can. I reckon you would like it. Thank you for your wise words on the elderly, next time my mother-in-law calls I will be more patient! 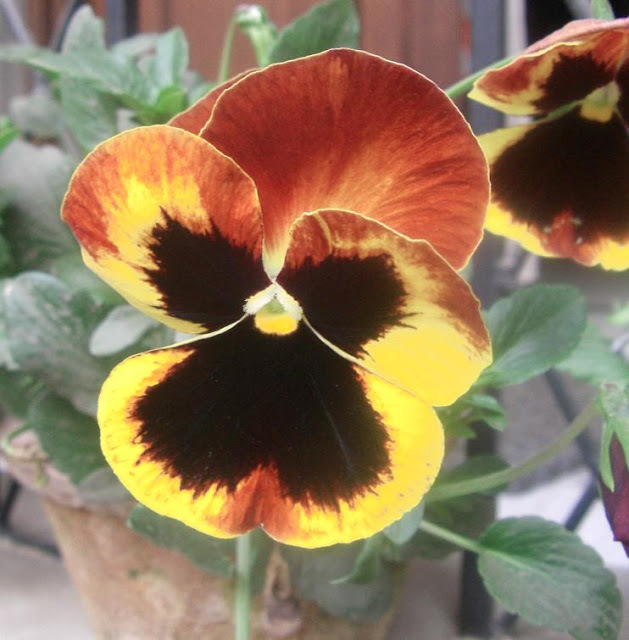 not looking forward to having my parents age...scares me...your pansies are gorgeous...I planted mine this week....so there is nothing up yet! Pleasure to read your posts as always. Lovely pansies. 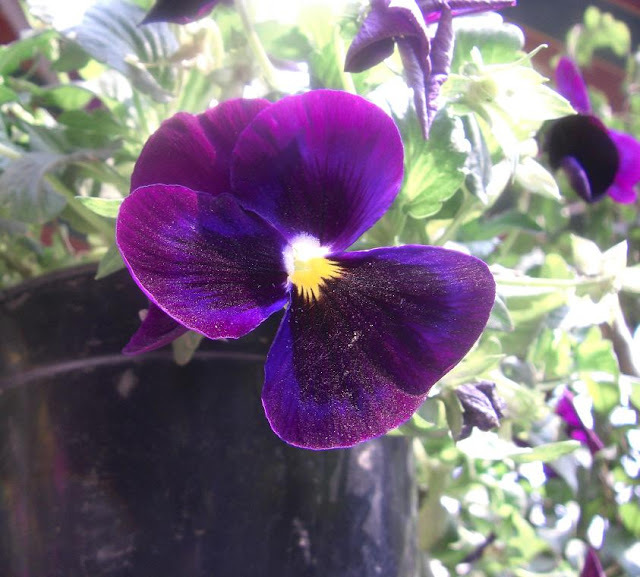 The pansies are so beautiful, a good reminder of the fragility of life, and how precious it is. Do remind yourself that one day it may be you that repeats themselves. My parents have both been gone for a very long time, if only I could just hear one word, any word from their voices....think of that next time, as though it is the last conversation you will ever have with them. You will be patient and kind. 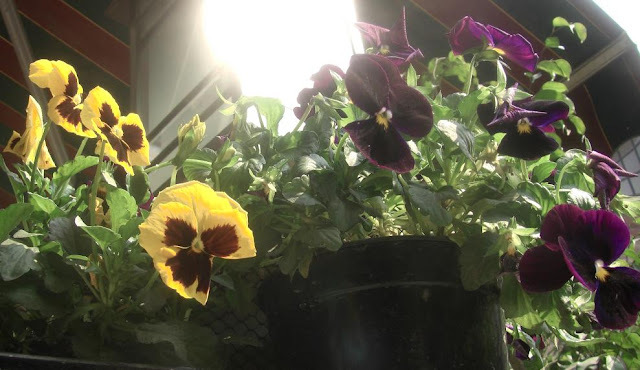 I hope these pansies brighten up your day as it did mine. When we are working and have children to care for, there are often lots of things on our mind. Some kind of irritation from loved ones makes us snap, which we regret later. Do take time to relax and rejuvenate. It is good for the body and soul. I can see that you care a lot for your parents. What yo do now will become the foundation from which pleasant memories are built for a lifetime to remember. I have lost both parents. Many simple things such as folding and ironing clothes, songs, cooking method reminds me of them. @kate: gardening is therapeutic, isn't it? @mildred: thanks a lot. at the moment, the situation is in control. thanks again. much appreciated. @Arundati: thanks for stopping by. @Trädgårdsmakare Hillevissan: thanks for stopping by. @frances: I know what you mean, and it makes me worse that they will not be around forever. @Autumn: thanks, it feels better. It is very difficult to see our parents as "old", because they were the strong ones for us when we were young and that memory of the strong ones remain in our memories. It is quite a shock to see them as frail, forgetful at times people. We get angry because we do not want to see them in that state. We do not want the replace the picture in our minds of how they used to be to what they are now. We love them but we do not want them to grow old we wish they would remain the same forever. When i read this post, i thought i wrote it. It's good to know I'm not alone in my thoughts. 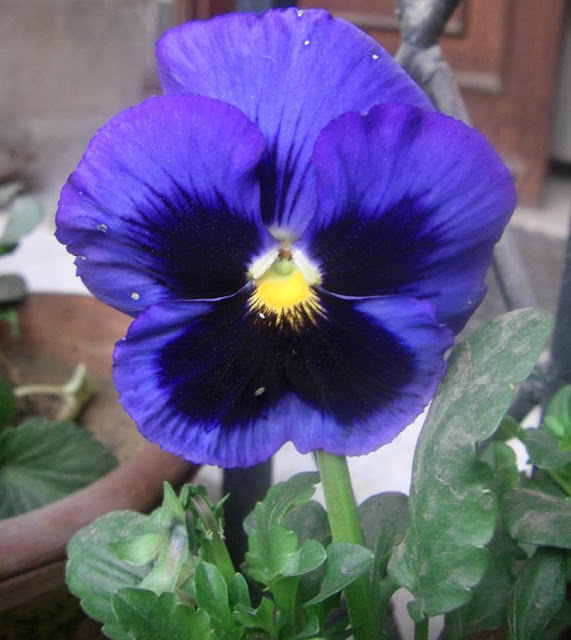 Pansies have always been one of my favourite flowers though I never knew the word meant "thoughts". I'm having similar issues as you with my one remaining parent and I need to remember to be more thoughtful and tolerant. One day, you and I too will be old and also one day, we will no longer have the pleasure and privilege of talking to our parents. Wish I could remember that in the "heat" of the moment. I'm trying. Beautiful--the thought and your flowers.